Every year thousands of pets are lost and many never find their way back to their owner's arms. Collars and tags can break or become unreadable, and not every pet wears these items at all times. Indoor pets can be especially vulnerable in the event of an emergency such as an earthquake or car accident, as they often do not wear collars or tags. We recommend microchips for all pets, young and old, indoor and outdoor, for just this reason. Microchips are a permanent form of identification for your pet. The chip is the size and shape of a grain of rice and inserted under the skin between your pet's shoulder blades. The microchip is encoded with a unique 15-digit number specific to your pet. 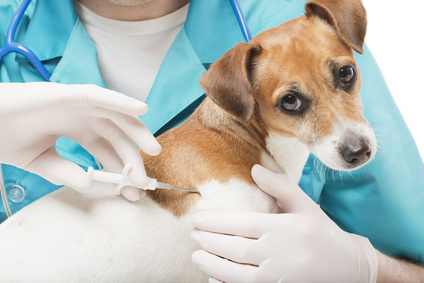 When you decide to microchip your pet, we inject the chip under her skin with a needle. It is a very quick and relatively painless procedure and reactions are very rare. When your pet is returned to you it is imperative that you register her with the microchip company. You can let us know if you would prefer we register for you, in which case we will have you fill in a microchip form. You will be asked to provide your name, phone number, address, and any other pertinent information. You also must keep the registry updated with any changes of address or phone number that may occur in your pet's lifetime. Registering your pet enters her into a national pet recovery database. If she is lost and turned into a veterinary hospital, animal shelter, or animal control office anywhere in the country she will be scanned for a chip upon intake. The scanner activates the chip and her unique number appears on the screen. The hospital or shelter will then call the recovery database and as long as your contact information with the registry is current, you will be advised of your pet's location and condition. Many owners are choosing to chip their young puppies and kittens these days, but even if you have an older pet we urge you to consider microchipping. It could save your pet's life! Visit PetLink.net today for more information and some absolutely amazing reunion stories!